UPDATE (March 25): The comments of BetVIP regarding the reported errors and alleged Trojan malware have been added to the article. BetVIP launched its Bitcoin poker site last week, and it looks to be gaining ground on the market, despite the early criticisms it received hours after its debut as posted on the Bitcointalk forum. 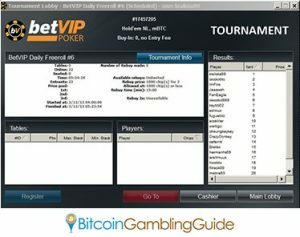 BetVIP Poker is already more than a week old in the Bitcoin gambling space, but it appears that more players are still needed on the platform before it becomes a strong competitor of the other poker rooms online. The lack of players, however, is not the main challenge for the new betting site as evident with its performance during its first week. Launching with an effective promotion, it attracted many bettors after promising to credit the first 50 players to post their BetVIP account username and wallet address in its official Bitcointalk thread. However, it is the software that needs to be focused on if the licensed Bitcoin sports betting site wants its newest venture to gain momentum. Several players already brought to the support team’s attention a series of complaints and constructive criticisms that are worth reviewing. For instance, a player complained about the bugs when depositing in the Mac software while another user pointed out the glitch that would kick him out of the table every time a new player would sit in. These kinds of errors have already been corrected by the development team already, according to the official responses to these inquiries. The official thread also showed the players’ concerns over difficulties in installing either of the Mac or Windows app. Using the criticisms to benefit in improving the software, BetVIP promised to work on the glitches as soon as possible and activate instant withdrawals this week—the lack of which during its first few days were taken negatively by a number of players. With the dedication to provide exemplary Bitcoin poker services, BetVIP Poker continues to hold freerolls and GTD tournaments exclusively tailored for Bitcoin players across the globe. Moreover, powered by the upgraded poker software from Enterra, BetVIP Poker will soon launch its HTML5 web app version, which will be useful in competing with the HTML5 poker tables of BitcoinPoker.gg–a new platform that holds a 1 BTC Freeroll on its grand opening.